Create a reusable discount schedule and discount tiers that automatically apply discounts based on quantity. Identify which quote line price fields are directly affected by discount schedules. Identify which records can use discount schedules, and which schedule takes precedence in the event of a conflict. Limit which price books are subject to discount schedule discounts. Buying in bulk is a good way to save money if you’re OK with buying a lot of something at one time. Why get a single roll of paper towels when you can get 40 at a nice discount? Businesses offer these quantity-based discounts to encourage larger deals, but it can be a challenge for sales reps to keep track of how much they should discount for given quantities. Salesforce CPQ can automatically apply the right volume-based discount for each specific deal by using a tool called Discount Schedules. You can think of a discount schedule as a table of quantities and percentages. In this example there is no discount for buying 29 of an item, but 30 qualify for the 10% discount, and 60 qualify for 20% off. There is no upper bound for the 90+ range because we want to give a 30% discount for any number of units above 90, whether it’s 100 or 1,000. Notice that the discount schedule uses 60 for both the upper quantity of the first tier and the lower quantity of the second. This can seem odd, but it makes sure there are no gaps for fractional quantities to fall through. If the upper quantity of the first tier was 59, then 59.5 would fall through the cracks and no discount would be applied. So, with discount schedules it’s understood that the upper quantity of a tier is NOT included, which is why buying 60 units qualifies for a 20% discount. As we saw in the last unit, AW Computing sells a security system with door locks, RFID badge readers, and RFID key cards. Customers typically buy enough cards for their employees and to have extras on hand. To encourage customers to buy more cards, AW Computing gives a 10% discount for buying more than 100 and a 20% discount for buying more than 200. To implement this requirement, you must do two things: Create the discount schedule, then tell CPQ to use the schedule on the RFID Key Card product. Click Discount Schedules from the navigation bar, then click New. For the Name, enter Bulk Keys. There are a lot of options to customize a discount schedule, but for now we’ll keep things simple. The Discount Schedule record is just a container for discount tiers, which is where we tell CPQ what quantities deserve discounts. So now we create two discount tiers. Each tier has four pieces of information we can define, and a plus symbol used to create a new tier. For the Tier Name, enter First Level. The tier name can be revealed to the customer, and is seen by the sales rep, so use something meaningful. For the Lower Bound, enter 100. For the Upper Bound, enter 200. Remember, the upper value is not counted as part of the tier. For the Discount (%) field, enter 10. Great, the first tier is finished! Time to create the second tier. Click the + symbol button. For the Tier Name of the second tier, enter Second Level. For the Lower Bound, enter 200. This tier does not have an upper bound so any quantity above 200 gets a discount. For the Discount (%) field, enter 20. Now that we have our discount schedule and discount tiers created, we just have to tell Salesforce CPQ that we want to use the discount schedule whenever the RFID Key Card product is added to a quote. Click Products from the navigation bar, then choose the All Products list view. 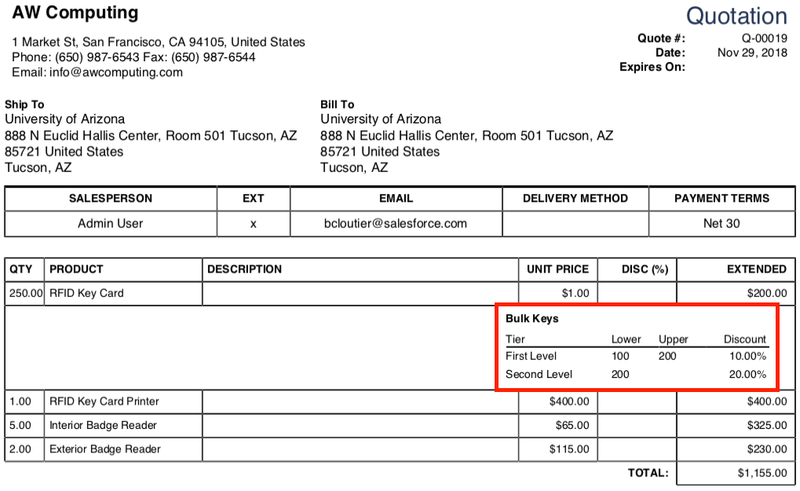 For the Discount Schedule field, find and select the Bulk Keys discount schedule. Great, now discounts are applied automatically whenever RFID Key Cards are added to a quote. Let’s test our work and see what the sales rep experiences when discount schedules are in play. Click Quotes from the navigation bar, then choose the All list view. Check the box for RFID Key Card. Click the arrow ( ) at the right of the page to open the quote line drawer for the key card. Notice the Regular Unit Price is currently the same as the List Unit Price. That means the Discount Schedule has not yet applied any discounts, which is expected since the quantity is 1. Change the quantity of the key card quote line to 120. Notice the regular unit price changes to $0.90, exactly 10% less than the list unit price. The discount schedule automatically applies a discount, no need for the sales rep to manually enter discounts. Change the quantity of the key card quote line to 250. The Regular Unit Price changes once again, this time to $0.80. Good work, your Discount Schedule is working as expected! Since the key card uses a Discount Schedule, an icon ( ) appears for the quote line. Hovering over the icon pops open an overlay to show the Discount Schedule details. As a side note, you can also include information about the discount schedule right in the proposal so your customer knows what a deal they can get for buying more. One last thing about our new Bulk Keys Discount Schedule. While we only applied it to the RFID Key Card, the Discount Schedule record itself is not specific to any product, so we can use it again for another product. A single Discount Schedule can be applied to any number of products, making them a versatile tool in quote pricing. In the RFID Key Card example, we updated the Discount Schedule lookup field on the product record. Now, every time key cards are added to a quote, the discount schedule is in effect. But what if AW Computing only wants the discount schedule to apply when key cards are sold in a specific bundle? 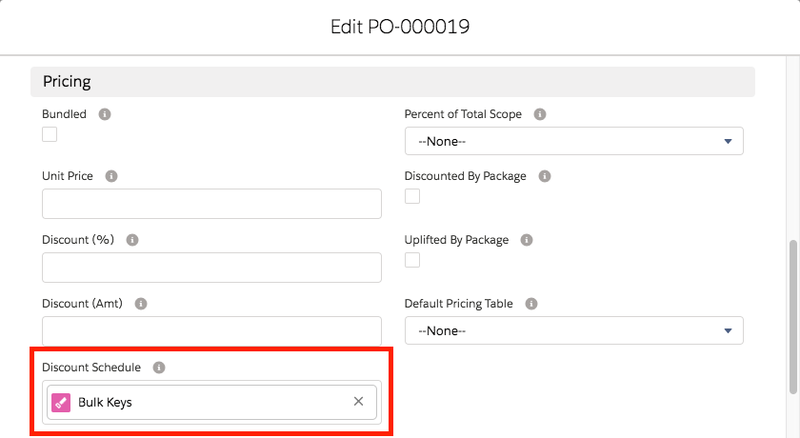 Salesforce CPQ supports this scenario too—Product Option records in bundles have their own discount schedule lookups. The administrator just needs to remove the Bulk Keys Discount Schedule from the Product record and update the Option record for the bundle. There are even more objects that have Discount Schedule lookups, allowing administrators to apply volume-based pricing in very targeted ways. Discounts only for a specific account. Discounts for one-time fees attached to subscription products or segments of the subscription term. Discounts only when a product is sold in a bundle. Discounts for every product in a bundle feature. Discounts whenever a product is added to the quote. Since discount schedules can be applied in so many different places, there are times when there can be a quote line that qualifies for two or more discount schedules. For example, AW Computing uses a discount schedule on the RFID Key Card product, but it uses a different discount schedule for the RFID Key Card in a contracted price for one of its customers. Only one schedule can be used for volume-based pricing of a quote line, so Salesforce CPQ chooses the one from the object with the highest priority. As you can see in the table above, Contracted Price has the highest priority, so CPQ uses that discount schedule. Sometimes businesses use different price books to control pricing for certain types of customers. For example, they can have a price book specifically for academic institutions. By default, discount schedules apply to all quotes, regardless of which price book is used. However, it is possible to identify price books that should not use a given Discount Schedule. Here’s how. Find the Excluded Pricebook IDs field on the Discount Schedule record. Now, paste in the Salesforce ID of the price book that shouldn’t use the discount schedule. From now on, quotes including that price book will stop using it. If you have multiple price books that shouldn’t use the discount schedule, add them to Excluded Pricebook IDs in a comma-separated list. There’s one last way to limit when a discount schedule is applied—by using the Product and Price Book fields together on the Discount Schedule record. 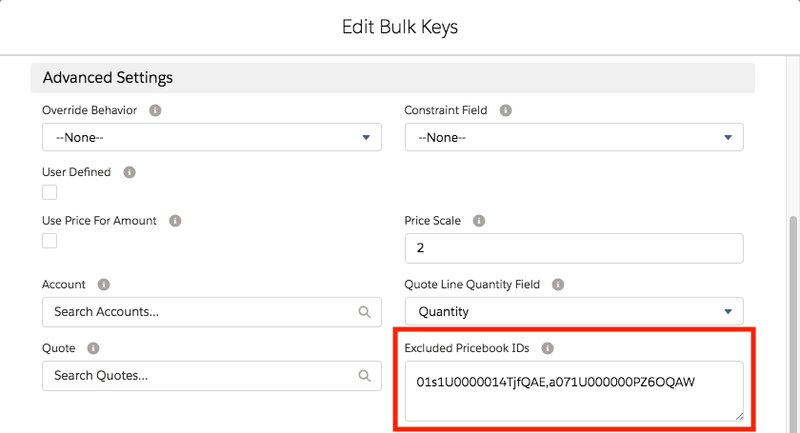 These two lookup fields are always used together and cause the discount schedule to apply only when the specified product is added to a quote that uses the specified price book. Note that these fields are rarely used because they’re so limiting, but they can be helpful in fringe use cases. Additionally, be aware that a discount schedule set up this way overrides the Discount Schedule lookup field on the Product record. That said, it still has the lowest priority when compared to other places discount schedules can be applied. For example, a discount schedule used for a contracted price still takes priority over a product and price book-specific schedule. Now you know how to create discount schedules and where to use them. Next, we look at how to adjust the way discount schedules count quantities when determining which discount tier to use.